The Thermophore MaxHEAT Therapy Pack (formerly Thermophore Arthritis Pad) is designed to be hands-free with a user-friendly on/off switch with a "Pause" feature and built-in timer. Just press "On" for heat, "Pause" to cool and alternate as often as you like. If you happen to doze off or are interrupted and forget the unit is on, the 20-minute timer will shut the unit off for your protection. LARGE - Our largest size is a generous 14" x 27" unit - nearly twice the size of most standard heating pads. Finally, a product that provides an area of heat therapy large enough to cover the entire spinal area, the length of a hip and leg or all across both shoulders, to effectively relieve pain and relax all the associated muscles - not just one small, isolated point. MEDIUM - The 14" x 14" size is specifically designed for smaller areas such as a shoulder, knee or part of the abdomen. The Medium unit is often a perfect fit for the back or hip of some of our smaller, more petite users, and many customers prefer this size to take along when they travel. MUFF - The Thermophore® Muff was created to surround sore, aching hands with comforting moist heat. Just turn it on, tuck your hands inside and relax, as the soothing heat begins to relieve your pain. Although the 17" long x 8" diameter tube design was intended for hands, it is also very simple to slide the Thermophore® Muff over an elbow, knee, ankle or foot, since adjustable hook-and-loop fastener(s) fasteners provide positioning flexibility to surround painful joints. PETITE - Designed for the neck, sinus or TMJ area, our Petite Thermophore® pack is also wonderful for applying moist heat therapy to specific joints - such as the elbow, knee or ankle. The 17"x 4" unit with a long hook-and-loop fastener(s) fastener allows adjustment for a snug fit on any small area. Doctors and physical therapists know that the intense, penetrating moist heat of Thermophore® brand products is a convenient, effective way to give patients hours of soothing relief. Having a Thermophore® of your own, to use at the first sign of pain, muscle spasm or stiffness, can often let you treat a minor problem before it has a chance to worsen and require professional attention. When you have an arthritic condition, injury, back pain or muscle spasm - any type of pain at all - it affects everything you do. 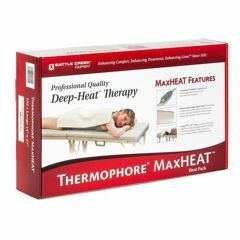 Our Thermophore® products provide the convenience of professional quality heat therapy - on demand, to significantly improve your ability to manage your own pain. Nothing to add, no unpredictable microwave bags or smelly creams. Just press the switch and relax, as the soothing heat begins to relieve your pain. If you live in a dry area, or the air in your home is dry because of frequent use of heating or air-conditioning systems, we also offer the Classic Plus™ and MaxHEAT Plus™ styles with a protective liner that lets you safely add a damp cloth for even more moisture! Unique design produces moisture from the atmosphere, with no need for you to add any water. If needed, Classic Plus™ and MaxHEAT Plus™ styles have a protective liner that lets you safely add a damp cloth for even more moisture! Warms up fast - large size covers large area - convient on/off button as probably will need to turn off after one-three minutes. Don't recommend for diabetics or anyone with nerve sensory problems as it gets hotter than most heating pads. No more pain in the "back" !!! Purchased for my Mom who suffers with arthritis. This heating pad provides her excellent back coverage and delivers needed heat into the muscles and painful areas associated with arthritis. Does heat up fast so may require an added cover or thick sweatshirt to prevent affecting the skin of an elderly person who requires assistance. My chiropractor used moist heat on my back and found it easier to adjust my back, so I purchased this product. Have only used it a couple of times - waiting for warmer weather. I'm glad I don't have to wet anything to use it. Extremely inconvenient because you have to whole the switch down for the product to operate. Otherwise, the product heats up sufficiently; however, it is also somewhat heavy. I will return this product and purchase a regular heating pad with an on/off switch. Great Product, but doesn't last as long as it should for Professional Use. Would be great for home use. Model 155 has a 20 minute timer with a "pause" function that allows the unit to cool a bit to customize the heat. To extend the time, push the "power" button again. The heating pad is encased in a fabric material (not plastic) and slid into the removable fleece cover provided. I find that it is flexible and holds its shape well. Is this made in china? do they last more than a few months? does it shut of by itself? The package says "proudly made in the USA ". I really prefer the controls on the Max Heat over the regular thermophore heating pad. This control will shut itself off after 4 5 minute intervals, or you can pause it and resume the heat, or turn it off yourself. All instructions are easy to follow. My first Thermophore pad lasted about 20 years. I just got the new Max Heat. Can you lay on top pf this and what is the Max heat deep heat therapy number so I can order the correct one? Also how hot will it get? UL requires a warning advising not to sit or lie on ANY electric heating pad. The internal components can get folded and crushed. MaxHEAT 14" x 27" is Model 155. Highest temp depends on several factors, but is set to the max allowed by UL. I have a neck and back thermophore and really like both because it pulls the moisture from the air to provide a moist heat vs. dry. I lay on mine and have no issues but it might not be as effective as if it were exposed to air so it can draw in the moisture. the units i have, you have control over how hot it gets, you just release the control when the heat is comfortable. I sit against my 155 on a sofa. This is my third unit in 16 years; they last 7 - 8 years used in this manner. The new MaxHeat is the weakest pad in terms of heat output - it's uneven over the period timed by the control - but I like that the control will turn itself off. If you lie on your MaxHeat, take care that it's completely flat, with no bunching. I would like to know all the instructions and the benefits of health will be include in the package? Thank you. An instruction booklet is provided. The booklet says use to help relieve the pain of: Arthritis, Muscle Spasm, Sprains, Fibromyalgia, Joint Pain, Sciatica, TMJ, and Bursitis.